In Quality Control, Eccox provides automatic processes to control the quality of codes based on previously set rules by the client organization. In terms of Quality Assurance, Eccox provides automatic processes rejecting the construction of codes that do not reach a minimum quality level and preventing them from being delivered to the next stage of the lifecycle. Eccox also monitors the evolution of performance tests in controlled environments, to prevent the delivery of objects that do not meet satisfactory performance requirements. 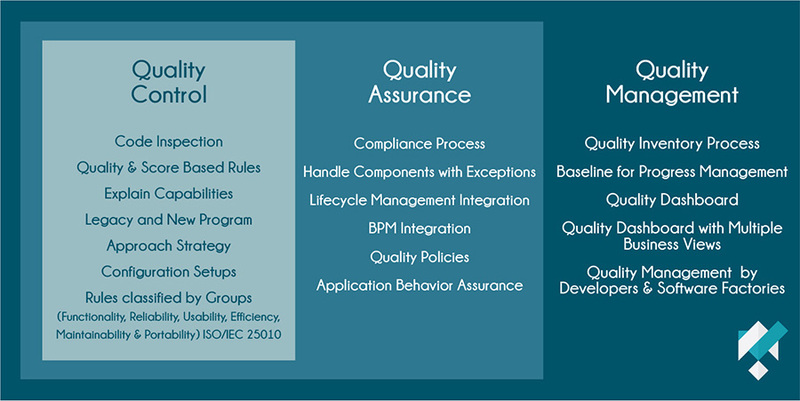 In Quality Management, indicators generated by extractors in quality control, quality assurance products and the change management process feed databases of Eccox Application Quality Management for IT Governance product, automatically providing information to aid decision-making that involves the management of the quality of the applications of the organization. Code inspection Automatic process for reading the source code, regardless of its size. Explains SQL accesses (DB2 and Oracle) Enables an assessment of the SQL code performance under execution conditions without executing it. Discrimination of Legacy code and New code Allows different treatment for codes that existed prior to the implementation of the process and codes produced following implementation. Evaluation rules Establish the criteria for evaluating the code. Notes and considerations Establish the severity or importance of each rule to the evaluation process. Signals Establish the minimum levels of “good” and “acceptable”. Plug-in in compilation or IDE Prevents the development process of a code without a minimum “acceptable” level. Approvals Enables controlled and managed process of an unsatisfactory code through a correction commitment. Exceptions Allows the administration of exceptions to the evaluation for codes of given programs or systems for certain rules. Customizable reports Allows the consolidation and relationship of information to facilitate the analysis of scenarios and situations that require decisions. Customizable graphs Graphically demonstrates the result of consolidations and relationships of information to facilitate the analysis of scenarios and situations.